The Canadian Nursery Landscape Association (CNLA) and the National Association of Landscape Professionals (NALP) have developed the Landscape Industry Accredited Company program to recognize Landscape Companies, Retail Garden Centres and Nurseries that are committed to excellence through Certification. Congratulations to Kevin Nauss, Owner/President of Price Landscaping. Kevin is pictured here, second from the right, with CNLA President Bruce Hunter, Professional Development Committee Chair Jeff Foley and Human Resource Committee Chair Harold Deenan. 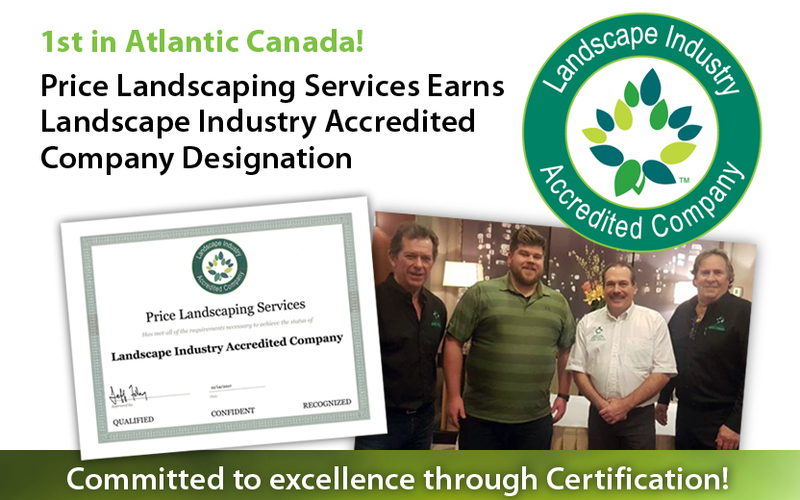 Price Landscaping is proud to be the first landscape company in Atlantic Canada to earn the Landscape Industry Accredited Company designation! Congratulations Kevin! Celebrating 50 years!